Dream of an opportunity to be mentored in a clinic that you can grow to be a team leader and make more than what most chiropractors make? Additional Information: An opportunity I wish I had when I graduated from chiropractic college! Why apply to work with us? 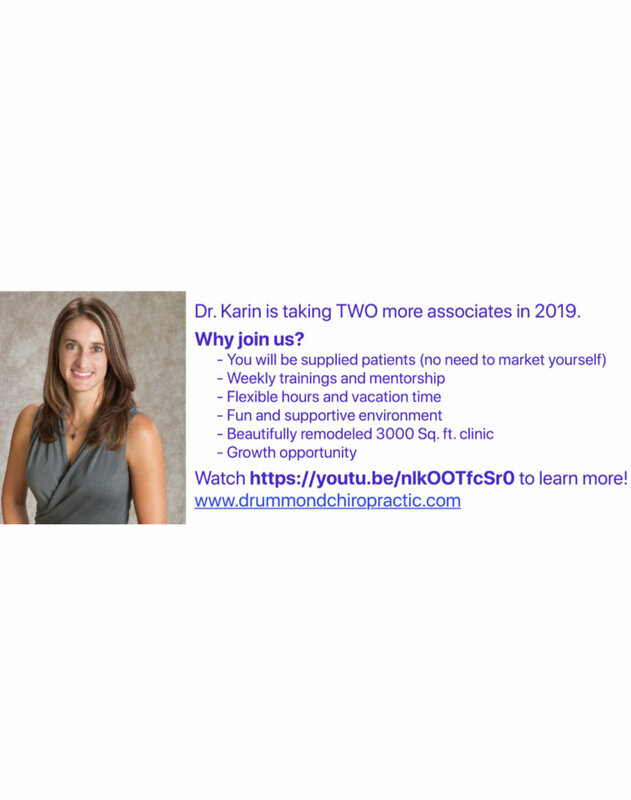 • Is it your dream to be part of a team with opportunity to grow from an associate to a team leader, with pay that is more than what most chiropractors make? Then look no further. • Do you hate to go out and drum up business, make salesy phone calls, call insurance companies, deal with billing issues? No worries! We have an amazing staff that takes care of all of that for you. • Would you like to have weekly training with the mentorship of successful chiropractors with 19 years of experience each? That's the owners: Dr. Karin and Dr. Dallas Drummond. • Do you want to live in a college town with big city amenities surrounded by lakes and forests? That describes where we are, in Bloomington, Indiana. • Do you want steady work, low stress, paid vacation, supportive staff and be part of a topnotch chiropractic team? Then you may be the chiropractor we are looking for!